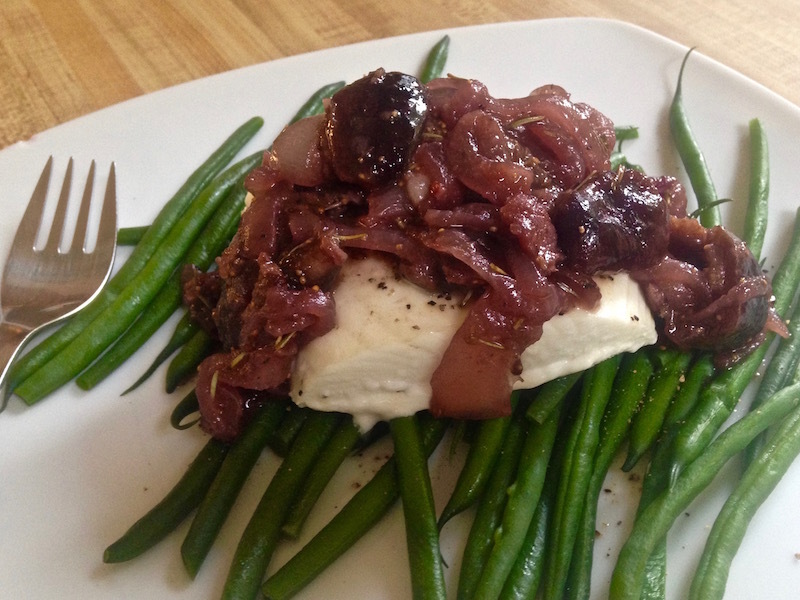 Halibut with Fig and Caramelized Onion Sauce | Keep It Up, David! I haven’t done a recipe post lately, probably because I’ve been traveling, but that changes right now. This recipe involves a fantastic and potentially hard-to-find ingredient: fresh figs. I love figs, but it’s much more common to find them dried than fresh. That’s because fresh figs have a short shelf life, bruise easily, and are hard to transport. I didn’t go looking for fresh figs, though – they found me. 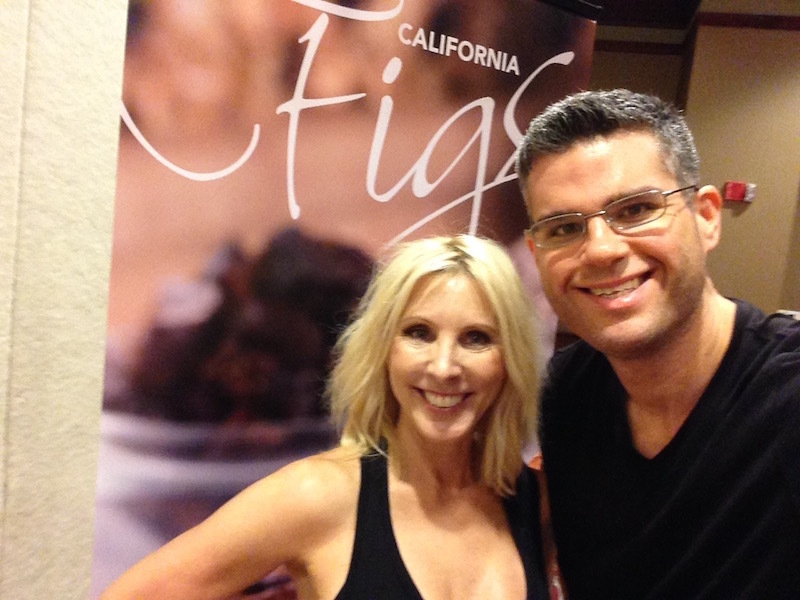 The California Fig Advisory Board was a sponsor at the Fitbloggin’ conference I recently attended, and they sent me home loaded down with fresh figs. Figs, by the way, are a good source of vitamins A, B1, B12, as well as calcium, fiber, and many other nutrients. I sure am using the word ‘figs’ a lot. Figs, figs, figs, figs, figs! Anyhoo. Onto the recipe. 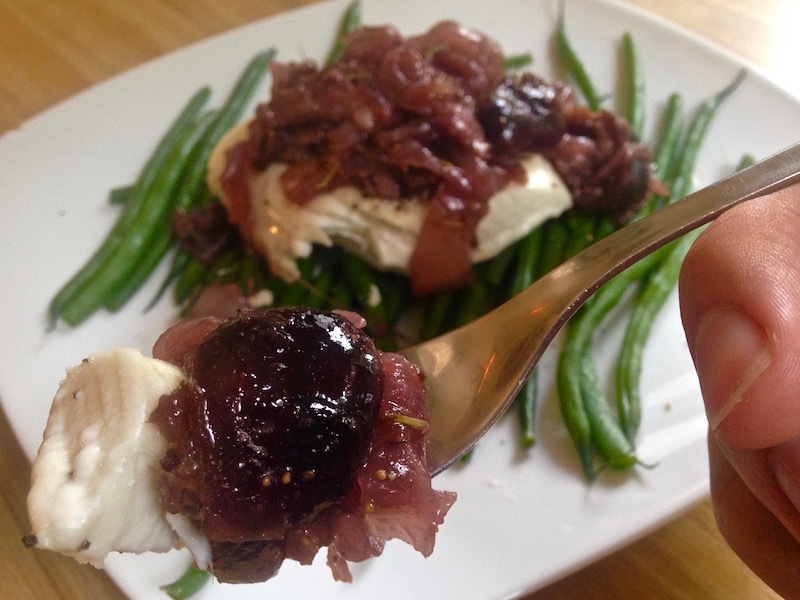 Here’s how to make Halibut with Fig and Caramelized Onion Sauce! It begins the way many great recipes begin: with bacon! 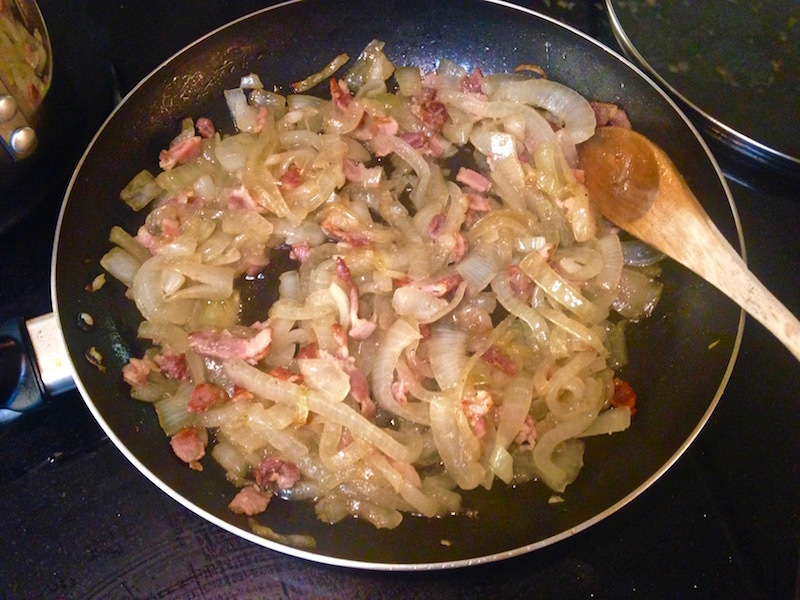 Chop up 3 slices of bacon and start cooking them in a pan over medium-low heat with 2 tablespoons olive oil. While it’s cooking, chop one big yellow onion into thin slices. Oh, and now’s a good time to preheat your oven to 400 degrees. 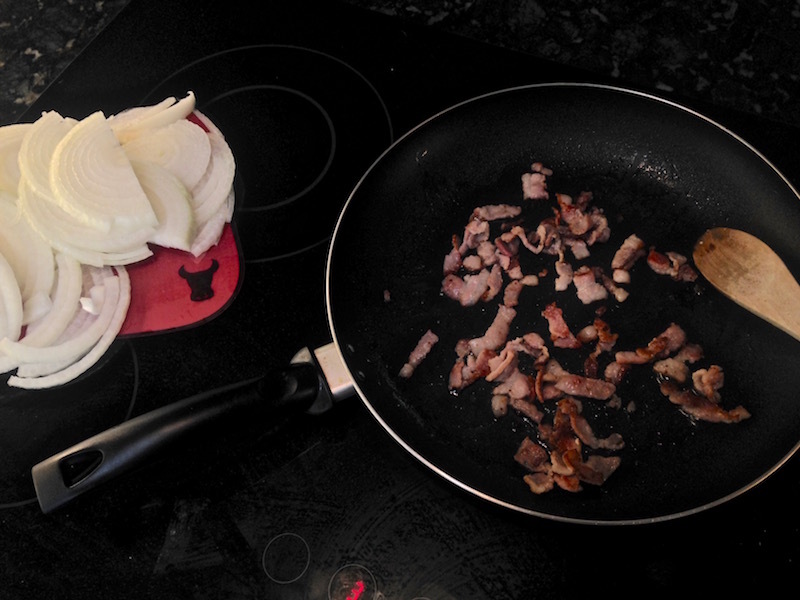 Once the bacon is well on it’s way, add the onions, and start cooking them low and slow. You ultimately want the onions to start to caramelize, and this may take 15-20 minutes. You can cover the onions at the beginning so they soften quicker. Go until they’re turning golden. Time to add the rest of the sauce ingredients! 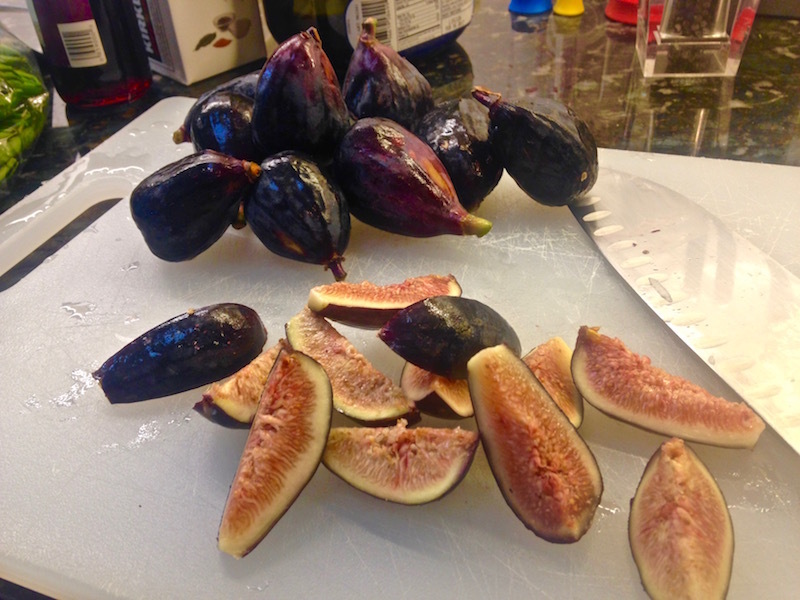 12 ounces fresh black mission figs, stems removed and quartered. It’s going to be very liquidy after you add in all these ingredients, but that’s ok, because we’re going to reduce it on the stove. 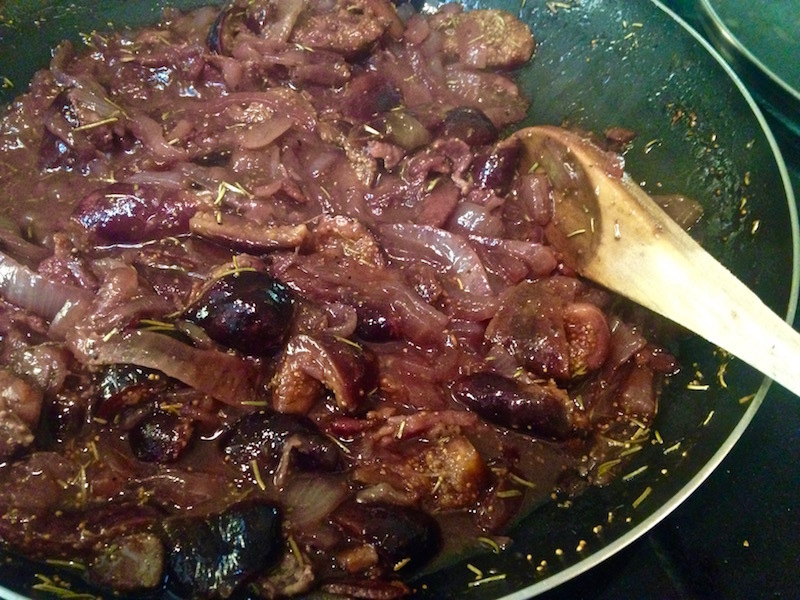 After simmering away for another 20-30 minutes, most of the liquid will have evaporated, leaving behind a thick, deep purple, flavorful sauce. While it’s reducing, cook the fish. 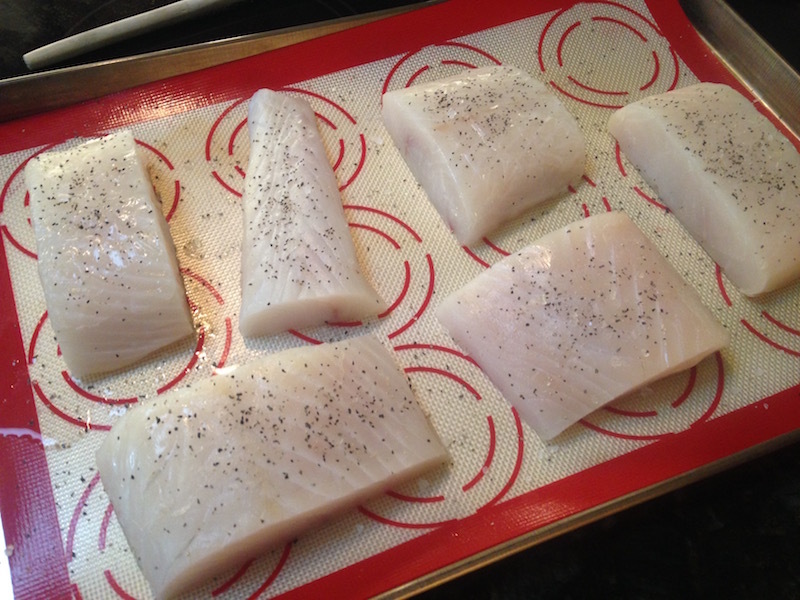 I used one entire package of Costco frozen Halibut (thawed), which came out to be 35 ounces split between six pieces of fish. I just sprinkled the pieces with a little salt and pepper, and they went into the oven for 15 minutes. I also steamed a ton of green beans, because veggies are always good. RELATED CONTENT: So many healthy recipes can be found on my Recipes page! Then, I piled it all up: Green beans on the bottom, then a piece of fish, then some of the sauce. I’m not just saying this folks: This was delicious! 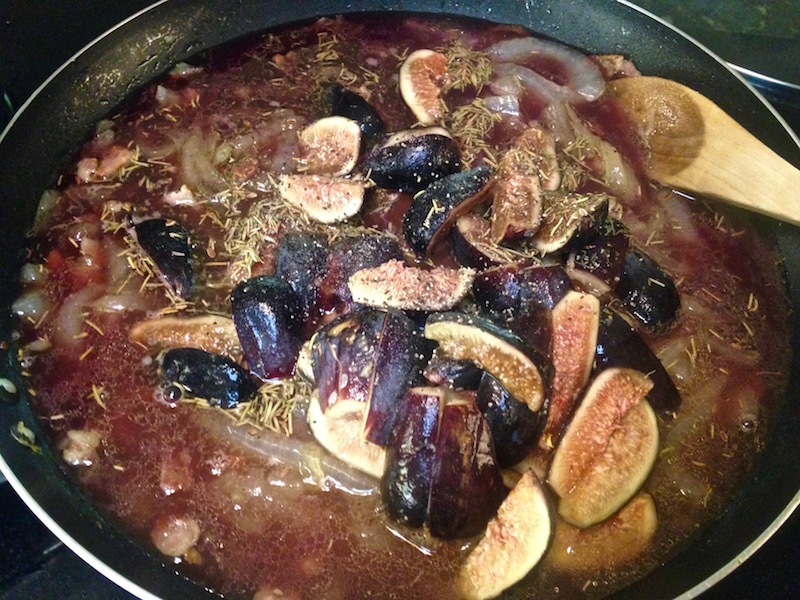 The sauce was sweet and rich, and the onions and figs provided nice contrasting textures with the fish. My parents said this was the best thing I’ve cooked for them on this trip yet! And, since I’ve been counting my calories lately (thanks to inspiration from my sister), I did the math, and 1 piece of fish + 1/6 of the green beans + 1/6 of the sauce = 464 calories. WHOA! Filling, delicious, and good for you. The holy trifecta! …and threw them on the grill. 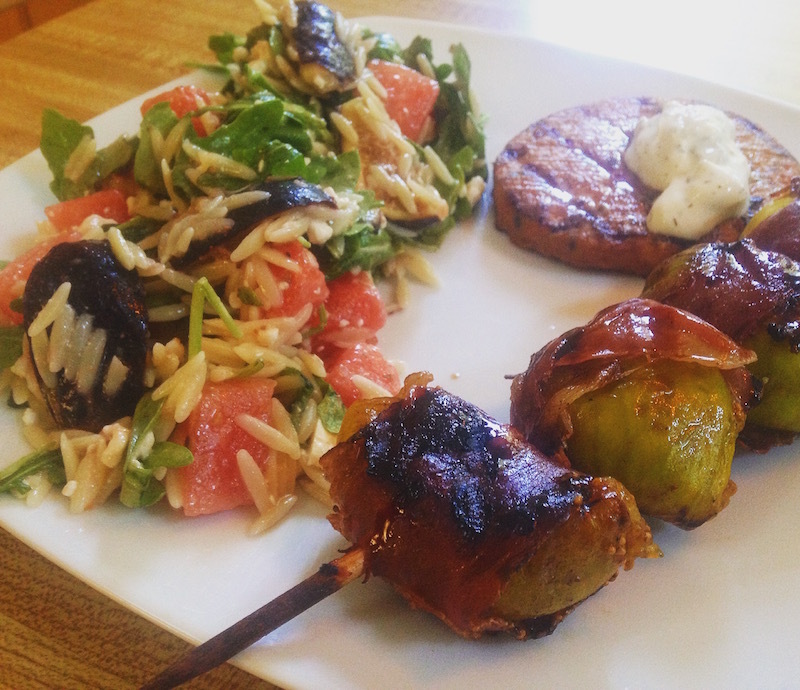 They were a side dish for another dinner, which also included a salmon burger and a watermelon, fig, and orzo salad, and they were incredible. Fruit and meat is the best! 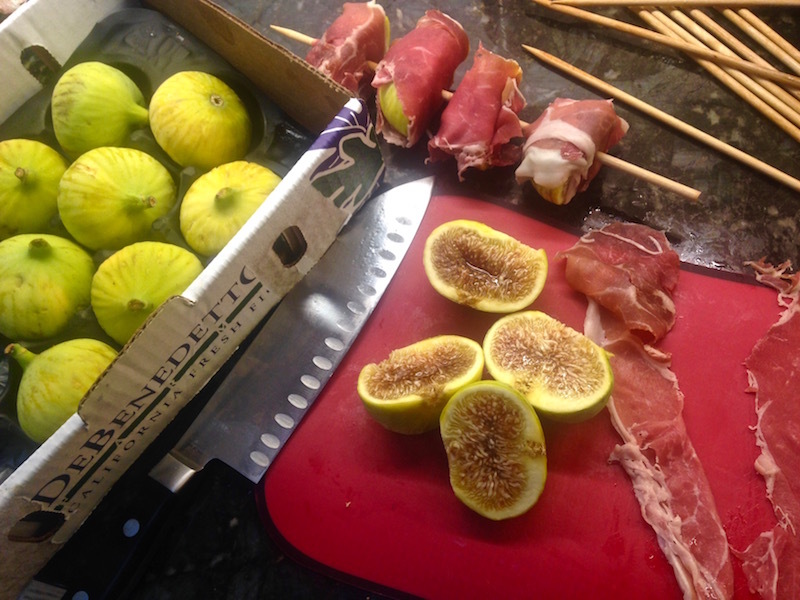 Each skewer, which had 4 fig halves and 2 total ounces of prosciutto, was 220 calories. This entry was posted on Thursday, July 28th, 2016 at 5:52 pm and is filed under Uncategorized. You can follow any responses to this entry through the RSS 2.0 feed. You can leave a response, or trackback from your own site.